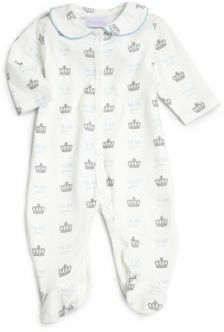 In celebration of the holiday season, I have put together a little list of some of the favorite clothes and toys of royal children from around the world to help inspire any of my readers who may be shopping for little princes and princesses themselves. I don’t have children of my own yet, but who doesn’t love to look at little kids’ clothes and toys? They’re adorable! 🙂 Enjoy! 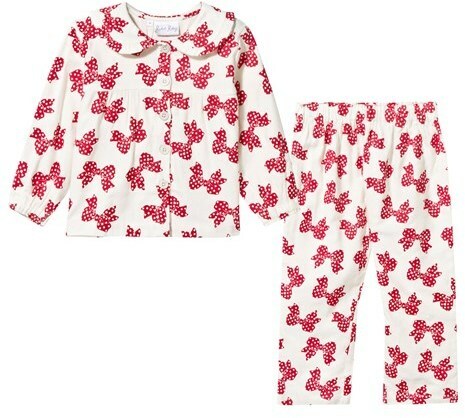 Since Prince George was just an infant, his mum, the Duchess of Cambridge, has made it clear that Rachel Riley’s clothes are her favorite choice in children’s fashion. 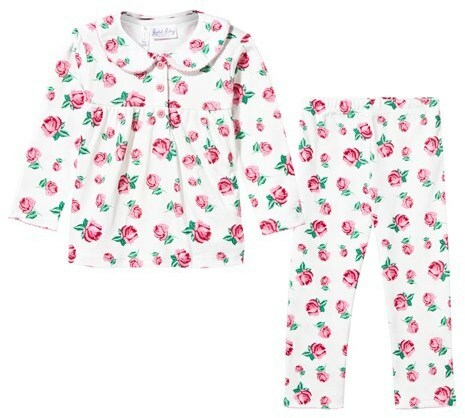 Here is a collection of some Rachel Riley clothes that are available right now that are either exactly what George and Charlotte have worn or similar. 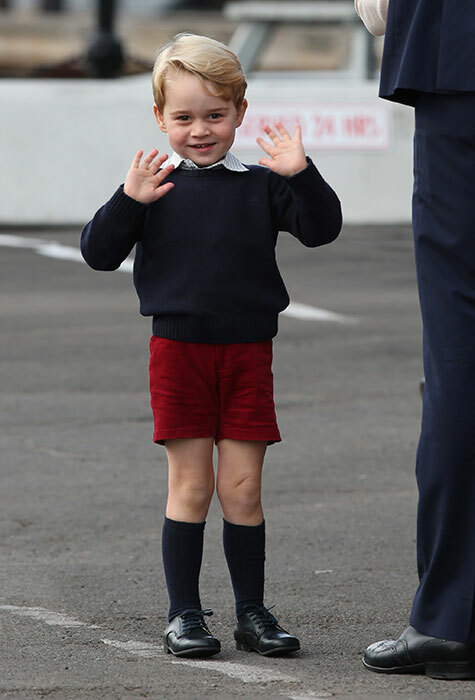 And the same dark blue pair that George wore. 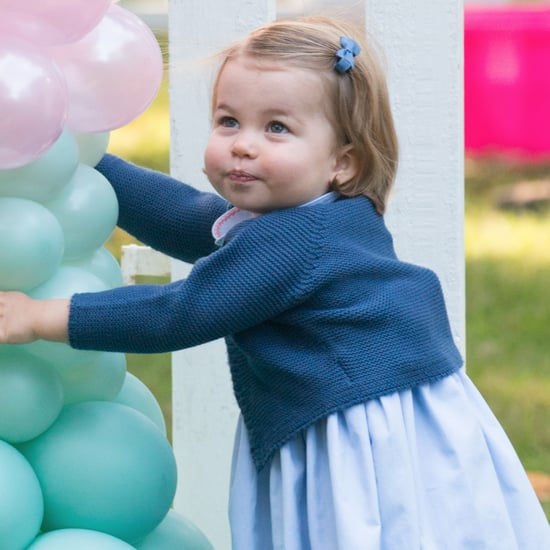 Unfortunately, we have only seen two official portraits of Princess Charlotte. One was the day of her christening, and the other was when she was first brought home from the hospital. 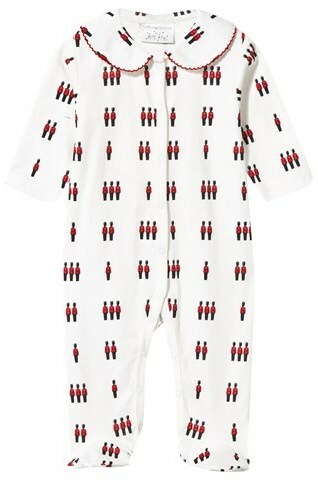 Here is a similar all white baby outfit that I think is really cute. George has been photographed wearing lots of cardigans like this one which I love. 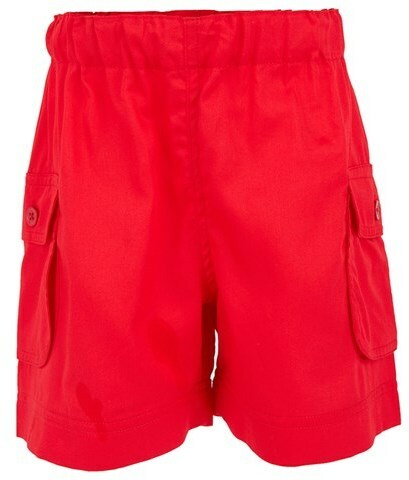 The little dogs on it are really cute and the red color would be great for the holidays. Obviously we do not know what Charlotte will be wearing for her very first Christmas but if I can make a prediction I would say that something like this little sweater would be a safe bet. 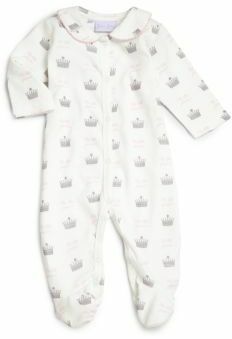 It has been reported that Kate will not dress Charlotte in a dress until she is one year old, which is a royal tradition. I like the little deer on this sweater. They are not specifically Santa’s reindeer but I think it kind of looks that way. 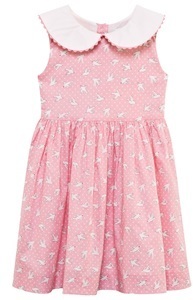 However, if Kate changes her mind there are lots of really cute Rachel Riley dresses available. 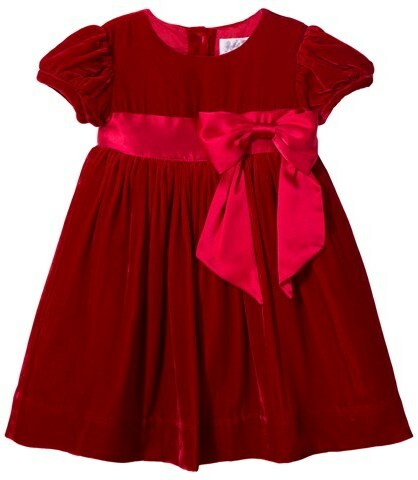 And if you wanted to get your little princess one here is a nice selection. 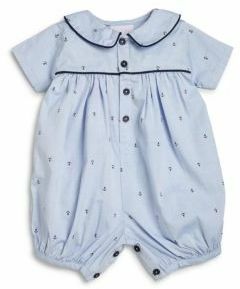 This pretty blue dress has cute smocking on the front. I like this navy blue dress as well. 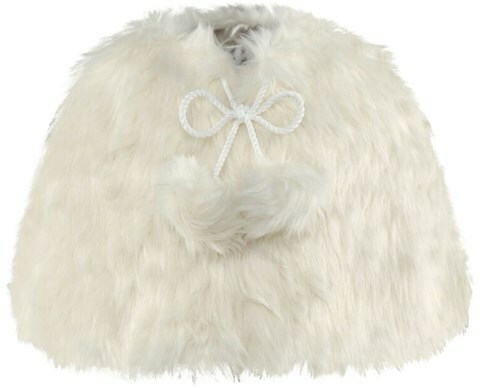 It would look cute with white bows in a little girl’s hair. 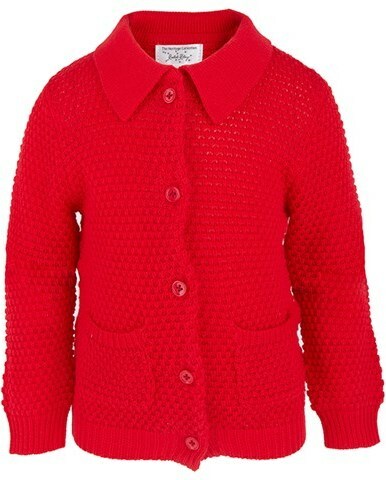 This velvet trim tweed skating coat is for older little girls but I can imagine Charlotte wearing this in the next year or two. 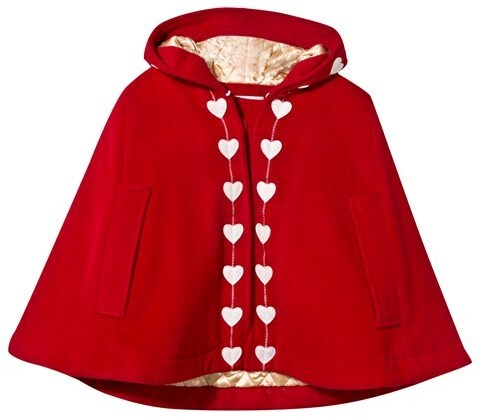 Princess Estelle of Sweden wears pretty little coats like this all the time. It has a bit of a classic, Victorian feel to it. Very pretty. 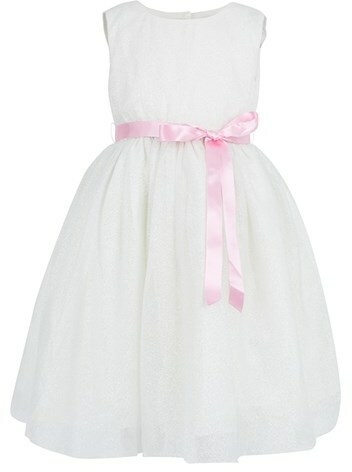 This little girl’s sparkle tulle dress is so sweet and delicate. 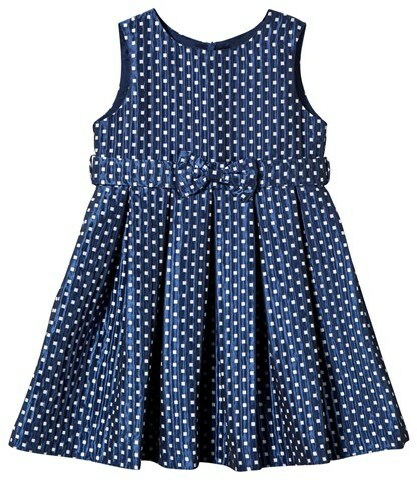 I also love this blue dress and little white hearts. 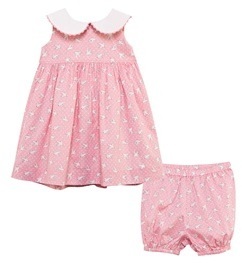 This is another pretty little outfit I would love to see Charlotte wear. 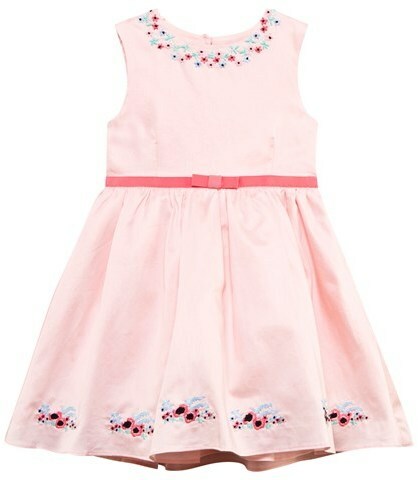 It has a cute bunny pattern and small polka dots. 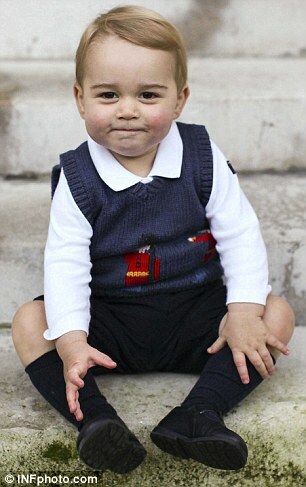 For a photo shoot last year, Prince George wore a sweater vest by Rachel Riley with a cute little soldier pattern on it. That sweater does not seem to be available anymore. 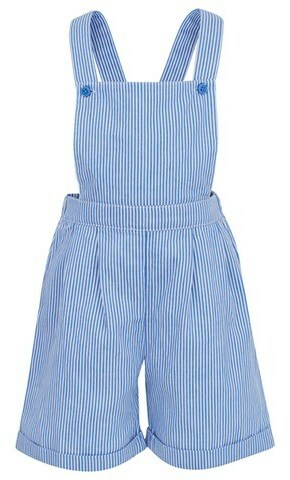 However, Rachel Riley did make a pair of dungarees with a similar pattern. 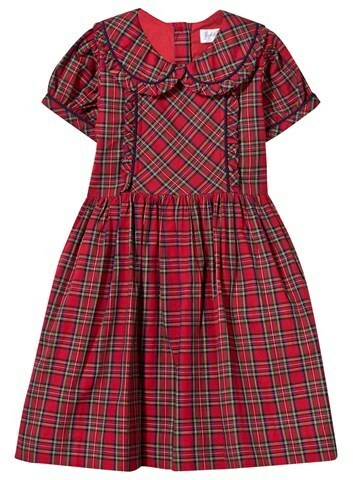 Rachel Riley has a beautiful red tartan dress available this season. 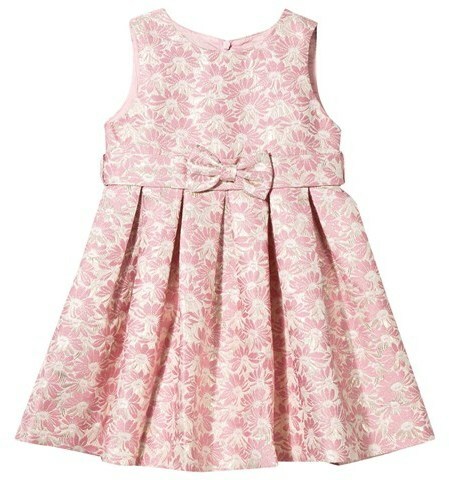 This is the type of dress I hope to see on Charlotte as she grows older. 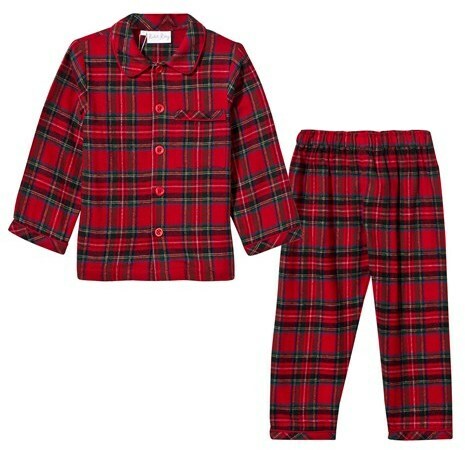 I think all little girls have worn a tartan dress during the holidays at some point in their lives so it seems to be a fashion right of passage. 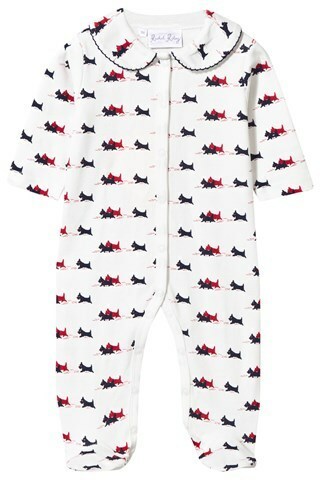 And finally, although there is no way for us to know what kind of pajamas George will be wearing on Christmas morning I like these British soldier patterned Rachel Riley pjs. 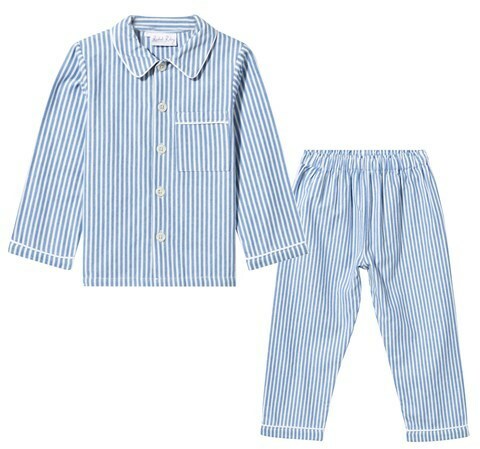 It seems like something Kate would dress George in. When it comes to toys, I have found some inspiration in museum exhibits, since Royals tend to use the same types of toys for generations within their family. 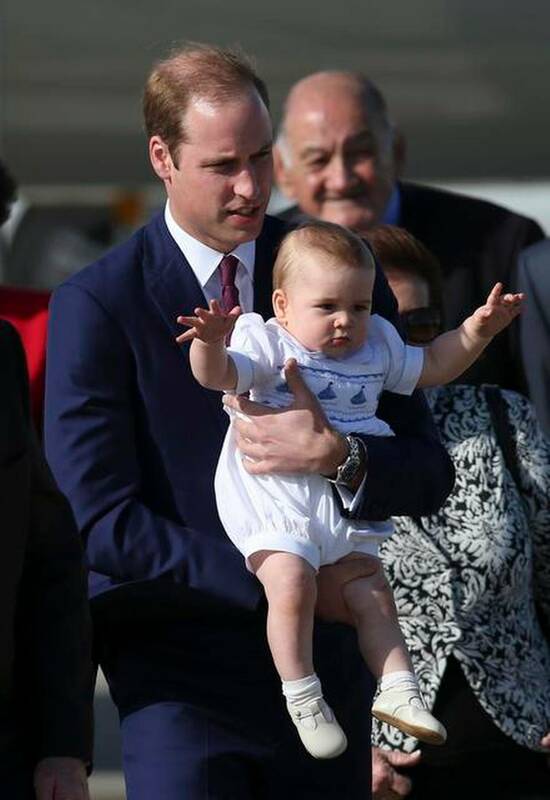 Royalty is all about maintaining tradition, after all. In particular, I discovered some heartwarming pictures of a little display of Queen Elizabeth II’s dolls. You can see a curator arranging the display in the picture below. The dolls are beautiful. But I especially love the little traditional English pram that Elizabeth used for her dolls. 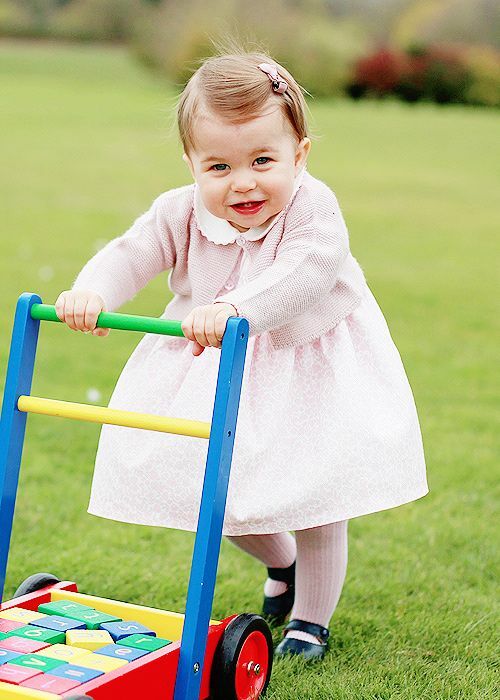 You can see the little Princess Elizabeth using the tiny wicker doll pram in the picture below. Considering how traditional Prince William and Kate seem to be I have no doubt that when it comes the time to purchase big kid toys for Princess Charlotte the will probably buy her a pram to go with her dolls. Doll prams can be in the thousands of dollars, almost as much as real baby prams as a matter of fact, but I have managed to find some really sweet and affordable doll prams for under $100 each. 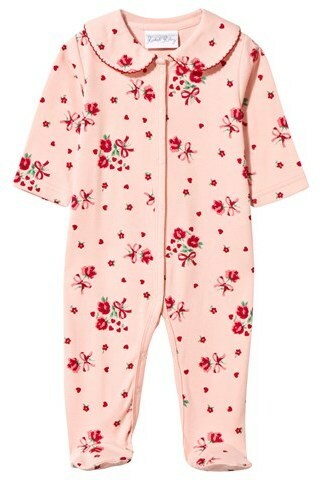 Starting with this sweet pink doll pram from Pottery Barn website. I also love this pink pram that is a 3 in 1 doll pram, carrier, and stroller for $59.99. Really cute and fun. 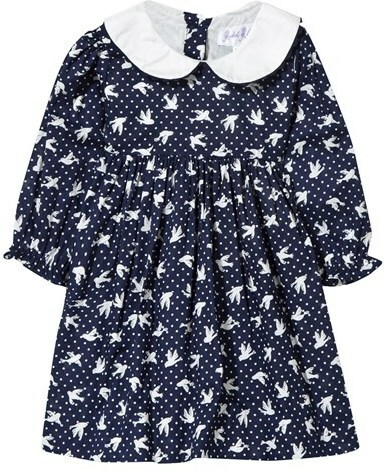 And although a lot of little girls will probably love the pink options I found, the most traditional or ‘authentic’ choice would probably be this navy blue version since most royal prams have been navy blue for many generations. For Princess Charlotte’s christening the little princess was strolled to the christening in the same pram that Queen Elizabeth used for two of her sons. 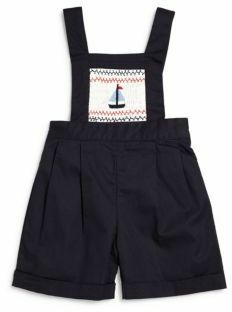 You can see it is a dark navy blue like the toy I linked to above. 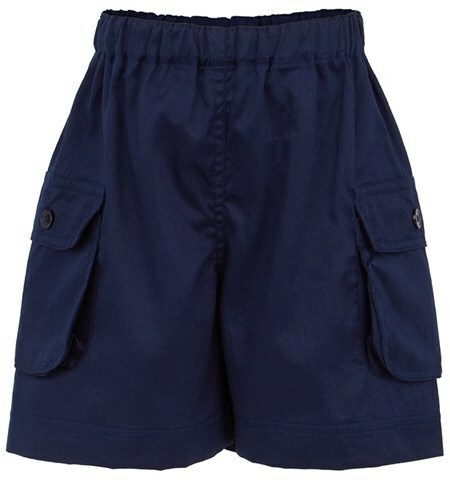 And here is another cute dark blue options. 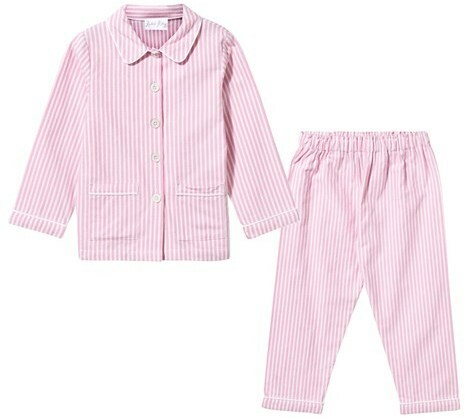 But this one is a nice compromise because it has pink trim and what looks like a little diaper bag. I really like the swirly handles on this one. It looks like fun! And the best part is it’s just $49.99, making it the least expensive one I found. I kept help but finish this section of the article with one of my favorite pictures of Diana, Princess of Wales as a child in her pram. It was probably used in the Spencer family for years. It looks like an antique. I can’t think of anything more representative of British royal childhood than this. The Danish royal family-and Danish people in general- have picked up on the German tradition of advent calendars, or Yule Calendars as they are called in Denmark. The most popular being Gift Calendars, advent calendars with little drawers or boxes with room for 24 little presents. The presents are normally little candies or chocolate but some boxes are big enough for a tiny yo-yo or, ball, or really little stuffed animal. If you buy a good quality advent calendar they can be used for many years and many are so pretty they became an essential element in your Christmas decorations. I just bought a brand new wooden German advent calendar this year and I plan on putting it out every year as a new tradition. Queen Margrethe of Denmark decorating her Yule tree. Here are some really pretty gift calendars that I like. Some of the really collectible ones by places like Erzgbirge Palace can be $700 be these are much more affordable. The first one is in the shape of a Christmas tree and the individual boxes are deep enough for a nice sized treat each day. This wooden advent calendar has a really pretty fireside scene on it. I like the fact that it has little boxes inside that are long enough for candy canes. And last but not least, this advent calendar is special because it’s actually musical so each day when you open a new door it plays a song. What kid wouldn’t love that? Like other Scandinavian royal families, the Norwegian royals know a thing or two about keeping warm during the winter. But more than any other realm, Norway has a reputation for having iconic knitwear. The Norwegian royals have often been seen wearing “Dale of Norway” sweaters and hats and I found a few nifty examples. 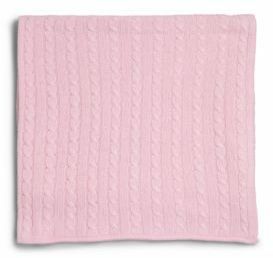 This pink child’s sweater has the traditional Norwegian pattern knitted on the front. 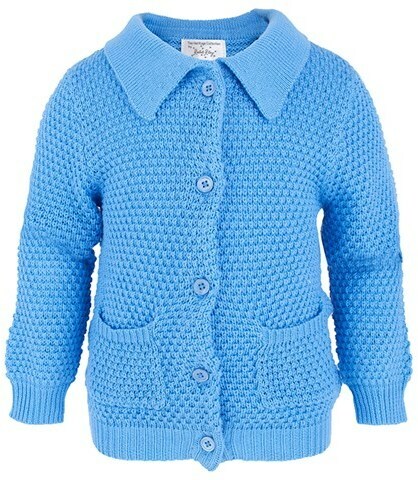 It is by Dale of Norway, which is a company that specializes in authentic hand knitted Norwegian designs. 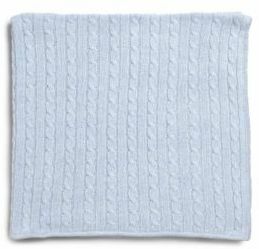 It can be really expensive but I found a few kids’ sweaters on Zappos.com that are more affordable. This one also comes in a few other colors like red and black. And here is another sweater in black and white. 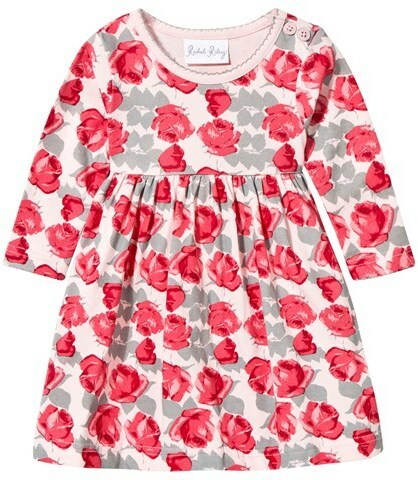 I like that it has a traditional, folk pattern and color neckline. Very stylish. Dale of Norway also makes some really neat hats. Here are a few examples. This one comes in black with a white pattern (as you can see in the picture) but you can also choose to buy one that is white with the pattern in black. 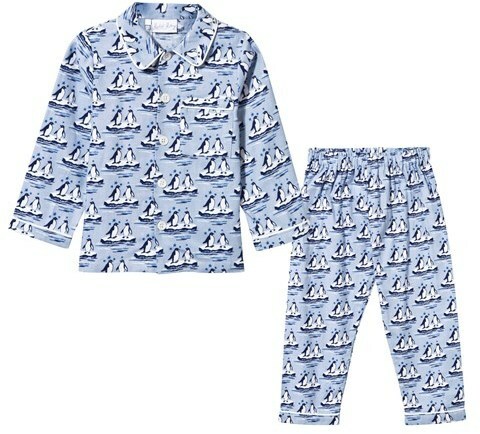 This example is navy blue and white. It’s a traditional knitted pattern that Dale of Norway has been making since the 1950s. And one final example. I like that the hats are unisex designs. Princess Mette-Marit loves hats like these. I hope that all of my fellow American have a great Thanksgiving tomorrow and that everyone travels safely!